Auditor tells trial he would have considered alleged refinancing arrangement "of greater significance"
The man in charge of auditing Anglo Irish Bank for seven years has told a jury that he would have considered an alleged refinancing arrangement of loans to Sean FitzPatrick as significant to the audit. Mr FitzPatrick (68), the bank’s former chairman, is accused of misleading auditors about multi-million euro loans from 2002 to 2007. He has denied all charges. 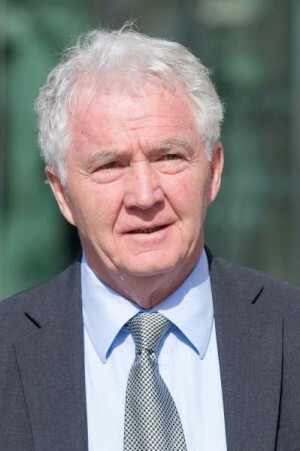 On day 79 of the trial at Dublin Circuit Criminal Court, Dominic McGinn SC, prosecuting, showed Kieran Kelly, a partner with audit firm EY (previously Ernst & Young) a number of loan facility letters from Irish Nationwide Building Society for the years 2002, 2003 and 2004. The purpose of the loans from Irish Nationwide were listed variously as the refinancing of Anglo loans in the name of the accused as well as loans in the name of others and loans linked to the accused’s shareholding in a partnership. The loan facilities, offered in September of each year, went as high as €18.3m in 2004. The jury saw the figure for directors loans was given in the bank’s 2004 annual accounts as just over €10m. Mr Kelly said in 2002 that he was not aware of a €4.4m loan arrangement Mr FitzPatrick had with Irish Nationwide (INBS). The witness also viewed documents, known as letters of representation, presented by the bank to the auditors. He said representation letters were “very important” for confirming “important aspects” of an audit. Mr McGinn told the witness that it will be for the jury to decide if the prosecution has proved what the INBS facility letters amount to and whether those refinancing arrangements should have been part of the letters of representation. He asked Mr Kelly about the significance of the loans to his audit in the case where the jury were to conclude Mr FitzPatrick’s loans were in existence during the financial year and Mr Kelly had not been told about the loans during the audit process. Mr Kelly said that the drawing down of the loans from Anglo wouldn’t have had a big impact on the audit. “Directors may take loans during the year and may repay, whatever their personal circumstances may have been and there may well have been a pattern of such activity,” he said. Mr McGinn then asked Mr Kelly would his view change if the jury were to conclude that arrangements were put in place at the year end specifically for those loans to be refinanced. He said he would first seek to understand the precise nature of the “refinancing”. He would also seek to understand “that all accounting and disclosure obligations in relations to our duties as auditors have been properly addressed”. He added that if he judged what was happening to be unusual he would be obliged to make reports to the bank’s board and audit committee. Mr FitzPatrick of Whitshed Road, Greystones, Co Wicklow has pleaded not guilty to 27 offences under the 1990 Companies Act. These include 22 charges of making a misleading, false or deceptive statement to auditors and five charges of furnishing false information in the years 2002 to 2007. The trial continues before Judge John Aylmer. Concluding his direct evidence, Mr Kelly told Mr McGinn that he stood over the truth and accuracy of a statement made by him to investigators and described by lawyers defending Mr FitzPatrick as contaminated by coaching. The process used to put the statement together has been ruled “unlawful” by the trial judge, Judge John Aylmer. He said that colleagues from EY, lawyers from A&L Goodbody, a legal firm representing EY, Kevin O’Connell and garda colleagues from the Office of the Director of Corporate Enforcement were involved in the process of producing the statement. He said he knew at the time that he was signing a declaration that he could face prosecution if he stated anything in the statement that he knew to be false or misleading. “I believe that the contents of this statement at the time I made it and I believe now, to be true and accurate,” he said. Mr Kelly completed his direct testimony at lunchtime and Bernard Condon SC, defending, asked the case to adjourn to tomorrow morning. The court heard that the defence had been served with a new disclosure of a “considerable amount of documentation”. “I need to be fully prepared,” Mr Condon said, referring to his cross-examination of the witness.